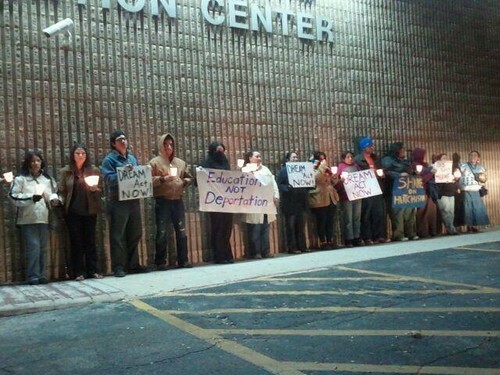 Community Stays out All Night to show their solidarity for those detained and TO SEND A MESSAGE TO SENATOR HUTCHISON THAT SHE MUST SUPPORT THE DREAM ACT NOW!~!~!~!~!~!~!~!~! More videos and images of the Senator's Arrests and the current Community Support outside of the detention center will be posted as they arrive. Thank you all again for your continued support and remember to Call Senator Hustchison NOW and OFTEN! Yeah. You go guys! Now that you have a criminal record, you go ahead and try and get yourselves legalized and get a job. And stop comparing what you did to Dr. Martin Luther King Jr. and the civil right's movements acts of civil disobedience. You're not fighting against a social injustice; you're trying to get a benefit to which you feel you are entitled but in reality, you aren't. As a UTSA alum, I am very proud of this movement! You all have a lot of courage to stand up for your dream.